The department of Biosurgery and Surgical Technology at Imperial College first entered Second Life in 2007. Initial work focused on the development of social platforms that would inform health policy within London’s National Health Service (NHS). The aim was to create health infrastructure and treatment pathways of the future that patients and medical professionals could experience virtually. This quickly expanded into consultation meetings and the creation of the Second Health islands (www.secondhealth.org.uk). As the pace of real world health reform quickened, so did the project. We are now working on creating virtual care networks across a simulated london borough. Surgical simulation and education have formed the basis for much of the research within the department. Therefore, reserachers are now exploring the feasibility of Second Life as an educational platform for training medical professionals. This has initially focused on team training within the operating theatre environment, but it is seeking to explore the unlocked potential of virtual worlds in the fields of patient safety and undergraduate education. This project aims to develop an effective model for the delivery of virtual patients following a game-based learning approach in Second Life. The four-dimensional framework described by De Freitas and Martin (2006), plus the learning types described by Helmer (2007), as well as the different aspects of emergent narrative described by Murray (1997) have provided the basis for the design of these game-based learning activities for virtual patients under two different categories: context and learner specification, and narrative and modes of representation. Phase I of this project focused on the delivery of a virtual patient in the area of Respiratory Medicine following a game-based learning model in Second Life. A pilot was carried out in March 2008 with 43 students. The feedback received has informed the development of Phase II which incorporates a multi-patient approach. Five virtual patients suffering from different respiratory problems, such as Asthma and COPD have been implemented. The same narrative and Activity Model is applied for all these patients including different modes of representation. The learner is asked to make decisions based on current information and acquires new information as a result of different decisions. Phase II will be released in August 2008. A web world environment has been implemented consisting of a three-tier architecture based on J2EE’s Model View Controller (MVC) design pattern – tier 1: web-server; tier 2: application server; and tier 3: database. This model accommodates the delivery of a one-to-many relationship between the user/student and several virtual patients. Do you enjoy using Second Life to communicate with others? Are you interested in learning about stress reduction techniques? Are you able to travel to downtown Boston? We are recruiting healthy people and their Second Life Avatars to take part in a research study. The study involves teaching the Relaxation Response within Second Life. The Relaxation Response is a form of stress reduction therapy. The eight week study comprises 8 training sessions in Second Life, each lasting 60 to 90 minutes. All participants will receive a Razer Piranha headsets to be used in the study and kept after the study ends. Additionally, study participants will be given $25 toward travel expenses to the Massachusetts General Hospital. The study does not involve any medication or blood draws. If you are interested in participating, please send an email to RRSLStudy@partners.org or call 617-643-6240. You may also IM our in world contact, Halton Alsop. Thanks for listening to our principal investigator Dr. Dan Hoch discuss healthcare in virtual worlds during the SL5B speaker series! Pathfinder Linden (RL: John Lester) currently serves as Linden Lab’s Boston Operations Director, coordinating the growth of Linden Lab’s East Coast presence. He also leads Linden Lab’s Proactive Education and Healthcare Mentoring Program, acting as a mentoring resource and academic evangelist for people using Second Life for teaching, academic and healthcare research, medical education/simulation, and scientific visualization. Pathfinder will talk about Linden Lab’s perspective on healthcare applications in Second Life, the critical connection between the healthcare and education communities, and future visions of how healthcare might best leverage virtual worlds. 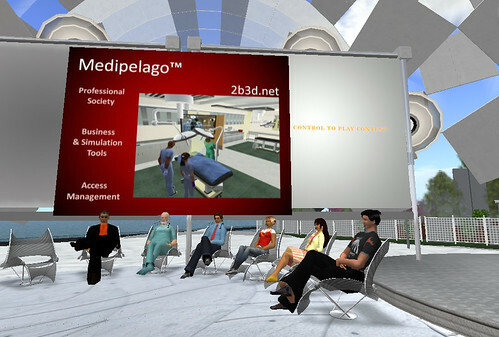 Medipelago and our partners are beginning a new era for professional societies in the digital immersive 21st century. We believe social networking in 3D spaces changes everything. So, we are offering access controlled 3D peer spaces and scalable virtual rentals for your business meetings, research collaborations, and educational courses. We have a simple mission: move photons, not people and use more silicon, and less carbon. It is less costly to meet in an immersive digital world, and its more flexible to use 3D software to make you productive, responsive, and motivated. 2b3d offers information services that feature 3d meeting spaces, collaborative environments and virtual real estate rentals to individuals, companies, professional societies or groups. We leverage virtual worlds and social networking to bring professionals together in a single immersive location. Our services help to reduce travel costs and human resource downtime. At 2b3d locations, you meet peers, access current research, hold conferences, working groups and collaborate with people on the leading edge in your field. Our mission is to build robust information service solutions with innovative tools to advance productivity, tell a story and create a rich environment for you to gather with colleagues and partners. This entry was posted in Events, Healthcare, Second Life, SLurl. Bookmark the permalink.